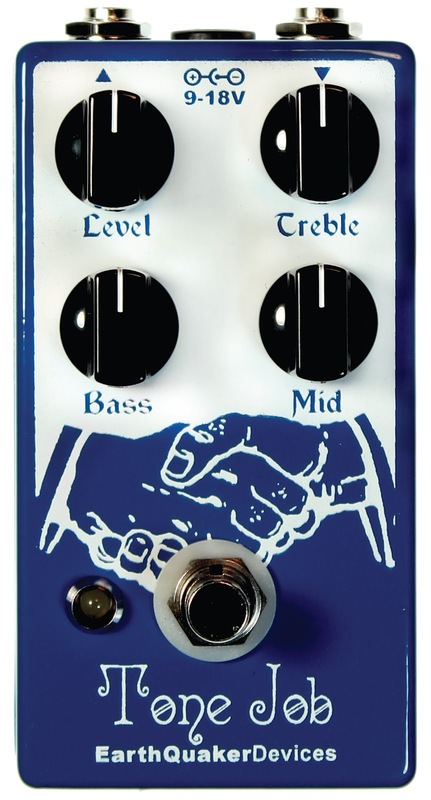 The newest creation from EarthQuaker Devices is here! Welcome to the Tone Job, a complete tone enhancement tool designed around a stereo preamp to cover as much frequency range as possible. What does this mean for you, the user? It means it can handle a wide variety of frequencies from electrical guitars, bass guitar, synthesizer machines and just about anything else you can plug in. The treble, bass and middle controls can cut or boost up to 20db. In addition to that, the level control will boost the signal (post EQ) up to 5 times the input depending on where the dial is set. It's very plug and play and easy to dial in on all applications. Level: Post EQ volume control. Can boost the signal up to 5x the input. Unity is around 10 O’ Clock. Treble affects frequencies from around 2k Hz up, bass affects frequencies from around 500 Hz down. The middle is an adjustable resonant filter acting as a mid-range control with it’s center frequency around 1k Hz. 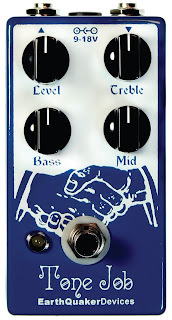 Treble and bass response are dependent on middle control settings.